At the youthful age of nineteen Bieke Vandekerckhove was diagnosed with ALS (a degenerative neurological disease, aka Lou Gehrig’s disease). Unexpectedly, three years later her disease went into remission and, even though partially paralyzed, she lived with ALS for more than twenty years. In twenty-seven short chapters, written at various points in her life, the author shares her search for meaning and strength. Much to her own surprise, she found both in the stillness of contemplation, in the richness of silence. The practice of Benedictine spirituality and Zen meditation became, as she says, the two lungs through which she breathes. 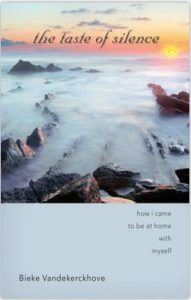 Along the way of her painful but illuminating journey, she shares insights learned from artists of all stripes, whether poets, painters, sculptors, or moviemakers, and from great contemplatives and thinkers. The result is a work that offers a deep trove of spiritual wisdom for every reader, whether afflicted with debilitating illness or in perfect health. This book won the Best Spiritual Book 2011 award in the author’s home country of Belgium. Bieke Vandekerckhove (born 1969) lived in Kuurne, Belgium. In 1988, when she was a psychology major at the University of Leuven, she was diagnosed with ALS and became paralyzed from the pelvis up. With round-the-clock help from husband Bart Verhulst and various assistants, she led an active life of teaching, counseling, and writing for, among others, Volzin and Tertio. Until recently she regularly conducted Zen meetings and retreats at the Benedictine Sint-Andries Abbey in Zevenkerken, Belgium. In 2014 Bieke Vandekerckhove received formal transmission as Zen Master (Ch’an Ssu) in the Chinese Ch’an tradition from internationally known Zen Master Prof. Ton Lathouwers, himself the Dharma-Successor of Ch’an Master Teh Cheng, longtime head of the Guang Hua Ch’an School in China. On the occasion, she received the name Xia Fan Zhi Guang, meaning “Light of Kenosis.” Bieke passed away in her home, early in the evening on September 7, 2015.